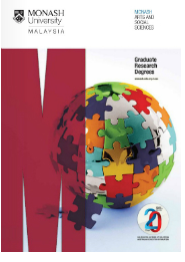 As a graduate research degree student with the School of Arts and Social Sciences at Monash University Malaysia, you will enjoy the autonomy of working independently and self-directedly on the topics you are most passionate about. Graduate research degrees are structured around allowing you to produce an original, innovative work of scholarship that will contribute substantially to wider understandings of your chosen subject. SASS offers two purely research-based graduate degrees – the Master of Arts (MA) and the Doctor of Philosophy (PhD). In both of these, the research degree is presented and assessed in the form of a formal dissertation. Enrolling in a graduate research degree at SASS, you will benefit from close interactions from its world-class faculty of scholars. Hailing from diverse disciplines across the humanities and social sciences, the SASS faculty is research-active, extremely well-networked through national and international collaborations, and deeply engaged with NGOs, industries, and communities both in the Southeast Asian region and globally. You will be given the opportunity to refine and shape your studies through consultation with at least two of these established experts, one of whom will be a dedicated, full-time supervisor. SASS’ unique research strength lies in the study of social transformation in Southeast Asia, and can be broadly structured into the following research clusters: (1) communication, media, and policy; (2) culture, religion, and gender; (3) literature, cinema, and society; and (4) politics, development, and governance. Researchers at SASS draw on a wide range of theories and methodologies in order to produce rich, nuanced, and innovative work around these themes, and are committed to linking their scholarship to practice, thus bringing meaningful change to the people and communities around them. As part of the graduate research student community at SASS, you will be an integral part of this collective. The research community is small, but vibrant, multidisciplinary, and collaborative – an approach well-suited to exploring the complex and dynamic social transformations in Southeast Asia. In addition to benefiting from the unyielding expertise of the SASS faculty and your peers, you will have the opportunity to attend cutting-edge seminars, workshops, and conferences, and will be welcomed into the wider Monash Malaysia community. Graduate research students may also apply for the prestigious Graduate Research Merit Scholarship for funding assistance, and enjoy additional financial aid through the Campus Travel Subsidy Scheme. As a graduate of these degrees, you will have developed finely-honed research skills, a dedicated area of specialization, in-depth methodological training in your field, and a wealth of academic experience. Graduate research degrees at SASS typically help students kickstart careers in academia, and can also open up a wide variety of research and analyses-based roles in external organizations. You will find that the skills, professional networks, and relationships developed over the course of these degrees endure across many different career trajectories, and leave you well-poised to make an impact in industry or community upon graduation. Find out more information on the application process, please consult the Research and Development Manager, Ms Eswary Sivalingam.